Mammals from the Age of Dinosaurs (the Mesozoic Era) are usually presented as little rat-like creatures, waiting for the big scaly monsters to go extinct so they can rise up and become diverse…and interesting. But discoveries from around the world over the last three decades have revealed that Mesozoic mammals, though usually small, were diverse, accessing different foods and moving around the environment in ways unsuspected by mammalian paleontologists until the fossils revealed adaptations for gliding, swimming, bounding, and climbing. Last month, a trio of specialized mammals from the Jurassic Period were described within two weeks of each other. A mammalian paleontologist’s dream! In this episode, Matt tries to show Adam why these three new animals – Arboroharamiya, Mecaconus, and Rugosodon – from about 160 million years ago are so interesting…even if Adam thinks they all still look like little rats. Click here to subscribe to the podcast and get updates every time we post a new episode. Click here to stream the episode on your computer or download the audio file. Click below to see images of these spectacular new fossils and a little more detail than we were able to cover in the podcast! Arboroharamiya jenkinsi – A haramiyid mammal (or close mammal relative) with teeth that would have let it eat bugs and seeds and feet that would have let it scramble through the Jurassic canopy. Megaconus mammaliaformis– Another haramiyid mammal, but unlike Arboroharamiya, Megaconus was built more for staying on the ground like a rock hyrax or armadillo. 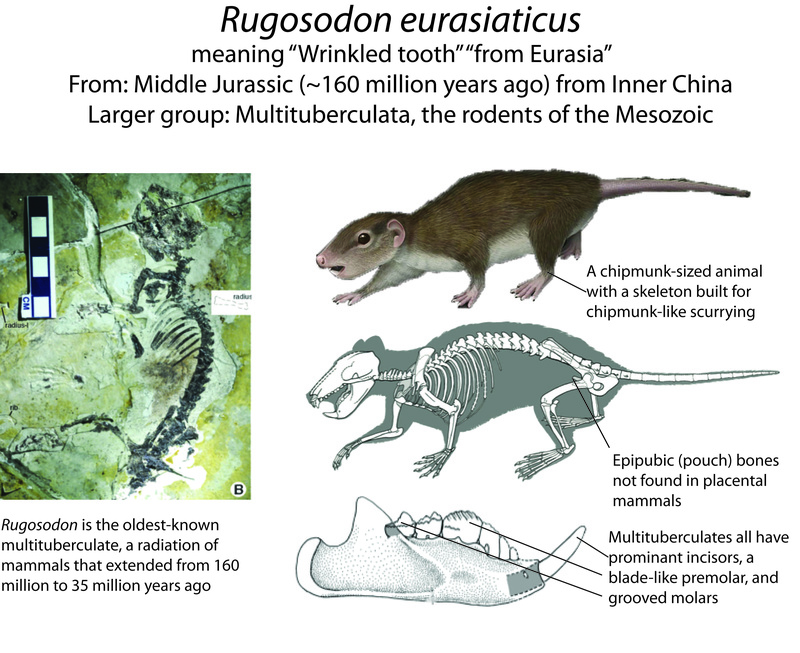 Rugosodon eurasiaticus– The oldest multituberculate mammal ever discovered. Multituberculates filled many of the niches occupied by rodents today and their teeth, including Rugosodon’s, were very rodent like. Rugosodon would have been a chipmunk-like animal, primarily scurrying through the undergrowth, but capable of climbing occasionally. Monotremes – Egg-laying mammals that retain many characteristics of the reptile-like ancestors of mammals. There are only two monotremes alive today: the platypus and the echidna. Eutherians – You are a eutherian, as is every placental mammal and all our ancient, developed-baby-bearing relatives. Multituberculates – The longest lived lineage of mammals. If longevity equals success, then multituberculates are the most successful group of mammals ever. Their fossil record extends from the Jurassic (~160 million years) – marked by the discovery of Rugosodon – to the beginning of the Oligocene 35 million years ago. Mammals during the time of the dinosaurs (the Mesozoic Era) didn’t get very big and for a long time they were cast as a bunch of small rats waiting for the End-Cretaceous extinction to wipe out the larger competition. But recent discoveries have documented large mammals from the Cretaceous as well as swimming, gliding, and burrowing mammals from the Mesozoic. 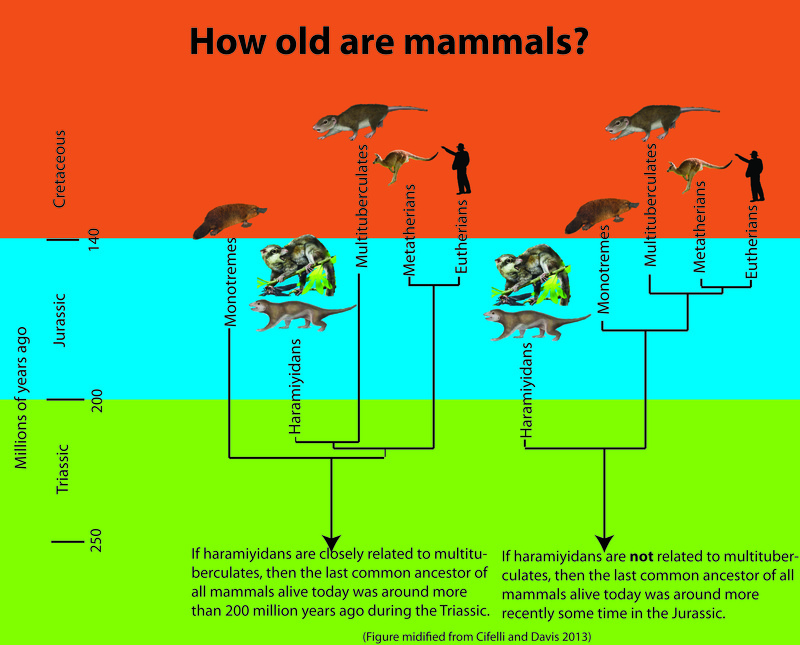 The three new fossil mammals we describe in this episode fit this new diverse pattern. These fossils are also important for helping paleontologists figure out the origins of mammals and the arrival of features like fur, complex inner-ears, and the upright postures that make a mammal a mammal. 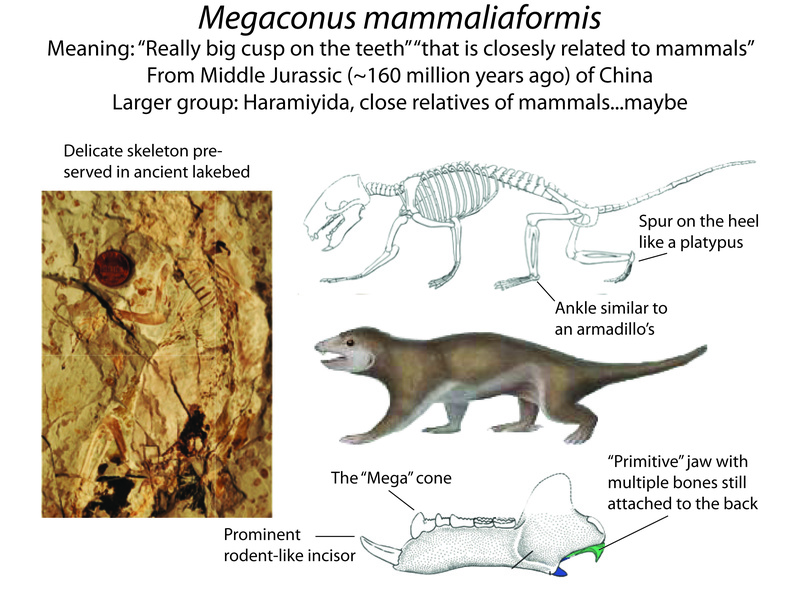 A careful examination of the ankle of Megaconus convinced the researchers who named it that it would have been comfortable on the ground, much like a living armadillo or hyrax. The ankle of Megaconus also sports a small spur, a feature found in many Mesozoic mammals and in the modern platypus. In the platypus, this spur is used to inject predators and other platypuses with a painful venom. But more on that in future episodes. Rugosodon’s place in mammalian evolution is better understood than the two haramiyidans, Arboroharamiya and Megaconus. The researchers who described the anatomy of this small mammal recognized the blade-like premolar and specialized grinding teeth as well as a few details of the skeleton, as features that link Rugosodon to multituberculates. Multituberculates were spectacularly abundant during the Mesozoic Era. This fossil marks the oldest record of a lineage that filled many of the niches during the Age of Dinosaurs occupied by rodents today. Multituberculates survived the End-Cretaceous extinction, but went extinct about 35 million years ago. The diversification of rodents has been implicated in their extinction. The relationship between multituberculates, with their long, grinding teeth and large incisors, and haramiyidans, also with long grinding teeth and large incisors as you can see from our images in this field guide, has important implications for the origin of the group we call Mammalia. Only more fossils from the Age of Dinosaurs (Mesozoic Era) can help paleontologists better understand the ecological role of mammals before the non-avian dinosaurs went extinct. More fossil material will also help paleontologists figure out where mammals came from and when they really began to diversify. There is plenty left to discover! Cifelli, Richard L. and Brian M. Davis. (August 8, 2013) Jurassic fossils and mammalian antiquity. Nature 500: 160-161. Wood, D. Joseph. The Extinction of the Multituberculates Outside North America: a Global Approach to Testing the Competition Model. Diss. Ohio State University, 2010. 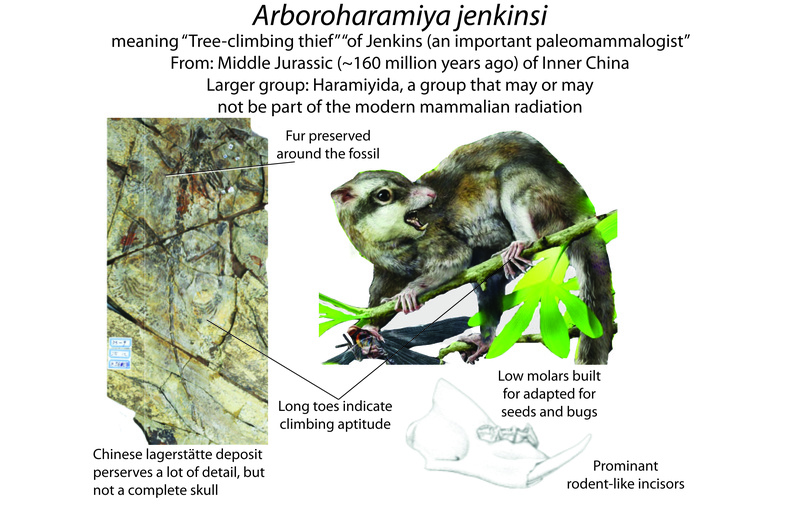 Zheng, Xiaoting, Shundong Bi, Xiaoli Wang, and Jin Meng (August 8, 2013) A new arboreal haramiyid shows the diversity of crown mammals in the Jurassic period. Nature 500: 199-202. Yuan, Chong-Xi, Qiang Ji, Qing-Jin Meng, Alan R. Tabrum, and Zhe-Xi Luo. (August 16, 2013) Earliest evolution of multituberculate mammals revealed by a new Jurassic fossil. Science 341: 779-783. Zhou, Chang-Fu, Shaoyuan Wu, Thomas Martin, and Zhe-Xi Luo (August 8, 2013) A Jurassic mammaliaform and the earliest mammalian evolutionary adaptations. Nature 500: 163 – 167.